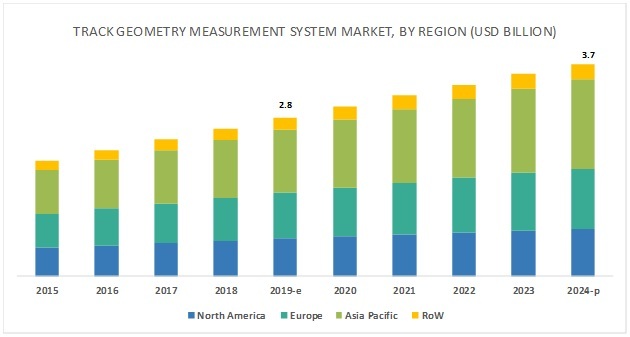 [143 Pages Report] The track geometry measurement system (TGMS) market is expected to be valued at USD 2.8 billion in 2019 and is likely to reach USD 3.7 billion by 2024, at a CAGR of 6.00% during the forecast period. 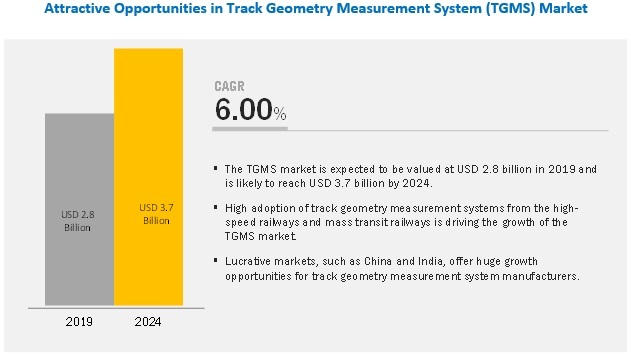 The use of track geometry measurement systems by the companies operating in the railway industry for complying with various standards and regulations is among the key factors driving the TGMS market. Moreover, the high popularity of no contact track geometry measurement system is another factor expected to considerably boost the growth of the said market in the coming years. The TGMS market, by operation type, is segmented into no contact and contact based track geometry measurement systems. The no contact based TGMS market is expected to witness significant growth during the forecast period. The major benefit of this operation type is that it is suitable for high and low speed. Also, it ensures high accuracy with the help of advanced technologies such as imaging technologies and optical laser sensors. Therefore, this type of operation method is gaining popularity for track geometry measurement. The market for vertical profile measurement type is expected to witness significant growth during the forecast period. Vertical profile is the track layout on the vertical plane. It is defined as the average height of left and right rails, which is calculated from the mid-point of these rails. The track class and permissible vehicle speed limit are determined by the railroad administration bodies by using these parameters as these are crucial for the operational efficiency of a rail. APAC is expected to account for the largest share of the TGMS market during the forecast period. The market in this region is also expected to witness significant growth during 2019–2024. One of the major reasons for the leading position of APAC is the rapid expansion of high-speed rails and mass transit system in the APAC countries such as China and India. Key players in the TGMS market include ENSCO (US), Fugro (Netherlands), MER MEC (Italy), Balfour Beatty (UK), Plasser & Theurer (Austria), Siemens (Germany), R. Bance & Co. (UK), Bentley Systems (US), Goldschmidt Thermit Group (Germany), and Egis (France). ENSCO is a well-known player in the TGMS market. The company has over 45 years of experience in providing solutions for the railway industry. ENSCO’s significant experience in the railway industry, along with its strong brand image and customer base, has led to its dominant position in the track geometry measurement system market. Recently, the company won several contracts for providing its products and services. For instance, in 2017, Canadian Pacific (Canada) awarded the ENSCO a contract to provide inspection systems for a new track evaluation car; Federal Railroad Administration (US) awarded ENSCO with a 5-year contract for operating and maintaining its 6 FRA track inspection cars. The company has strong presence in North America and is trying to strengthen its presence in other regions through expansions. In May 2018, Balfour Beatty (UK) was awarded a 5-year “Reactive Building and Civils Contract” by Network Rail (UK). This contract is worth up to USD 64 million (£50 million) and requires Balfour Beatty to execute rail infrastructure repairs and projects along the Great Western route from London to Penzance. In November 2017, ENSCO (US) announced that Canadian Pacific (CP) (Canada) awarded the company a contract to provide inspection systems for a new track evaluation car. This car will be equipped with track measurement and imaging system technology and will include track geometry measurement system (TGMS), rail profile measurement system (RPMS), deployable gage restraint measurement system (DGRMS), joint bar inspection system (JBIS), track component imaging system (TCIS), driver view imaging system (DVIS), and track view imaging system (TVIS). In October 2017, Bentley Systems (US) introduced the OpenRail solution, comprising applications and services for comprehensive planning, engineering, project delivery, and operations of rail and transit infrastructure. What are the emerging applications of track geometry measurement systems? How advancements in the railway industry is influencing the TGMS market? Which operation type track geometry measurement system is expected to penetrate significantly in the TGMS market? Which countries are expected to witness significant growth in the TGMS market? 13.1.7 R. Bance & Co. The study involved 4 major activities to estimate the current market size for track geometry measurement system (TGMS). Exhaustive secondary research was done to collect information on the market and its peer and parent markets. The next step was to validate these findings, assumptions, and sizing with industry experts across value chain through primary research. Both top-down and bottom-up approaches were employed to estimate the complete market size. Thereafter, market breakdown and data triangulation were employed to estimate the market size of segments and subsegments. In the secondary research process, various secondary sources have been referred to for identifying and collecting information important for this study. These secondary sources include railway journals and magazines, IEEE journals; annual reports, press releases, and investor presentations of companies; white papers; certified publications and articles from recognized authors; and directories and databases such as Factiva, Hoovers, and OneSource. In the primary research process, various primary sources from both supply and demand sides have been interviewed to obtain qualitative and quantitative information important for this report. The primary sources from the supply side included industry experts such as CEOs, VPs, marketing directors, technology and innovation directors, and related executives from key companies and organizations operating in the TGMS market. After complete market engineering (including calculations regarding market statistics, market breakdown, market size estimations, market forecasting, and data triangulation), extensive primary research was conducted to gather information as well as verify and validate the critical numbers arrived at. 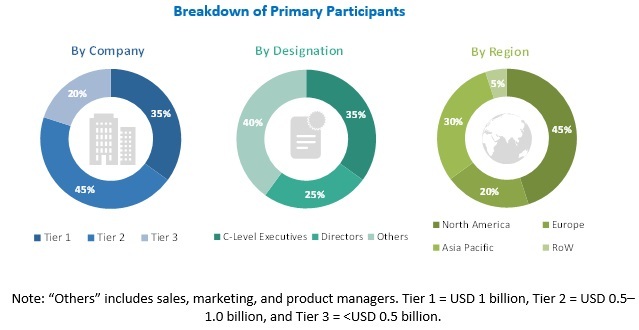 In the complete market engineering process, both top-down and bottom-up approaches have been implemented, along with several data triangulation methods, to estimate and validate the size of the TGMS market and other dependent submarkets listed in this report. In terms of value, the industry’s supply chain and market size have been determined through primary and secondary research processes. After arriving at the overall market size from the estimation process explained above, the overall market has been split into several segments and subsegments. To complete the overall market engineering process and arrive at the exact statistics for all segments and subsegments, market breakdown and data triangulation procedures have been employed wherever applicable. The data have been triangulated by studying various factors and trends identified from both demand and supply sides in industrial and nonindustrial verticals. ENSCO (US), Fugro (Netherlands), MER MEC (Italy), Balfour Beatty (UK), and Plasser & Theurer (Austria), among others (total 20 players are covered). This research report categorizes the TGMS market based on technology, scanning type, application, vertical, and region.